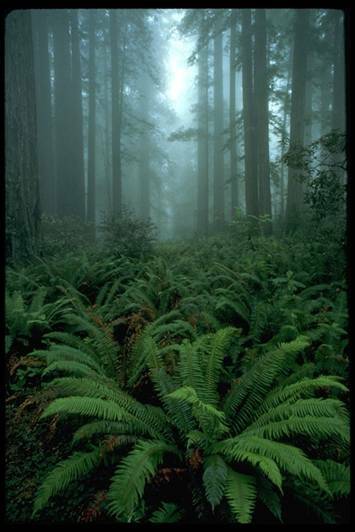 Elevation: Western sword fern grows from sea level to mid-elevations in the mountains throughout its range. Its elevational limit in Montana is 3,000 feet (914 m). In California it is usually found below 2,500 feet (762 m). In coastal Oregon it is found below 1,700 feet (518 m). Very common in Western Washington. (Populus trichocarpa), Vine maple (Acer circinatum), salal (Gaultheria shallon), twinflower (Linnaea borealis), cascade Oregon-grape (Mahonia nervosa), false lily-of-the-valley (Maianthemum dilatatum), rusty menziesia (Menziesia ferruginea), western springbeauty (Montiasibirica), wood sorrel (oxalis oregona), thimbleberry (Rubus parviflorus), salmonberry (Rubus spectabilis), threeleaf foamflower (Tiarella trifoliata), red huckleberry (Vaccinium parvifolium), evergreen huckleberry (Vaccinium ovatum), evergreen violet (Viola sempervirens), pioneer violet (Viola glabella). Sword ferns can be collected by dividing the clump and rhizome. They can also be propagated by spores. Sword ferns may be divided in spring if the rhizome is large and the roots are well developed. Propagation: Collect the spores when mature, usually from July to late August. An easy way to collect the spores is to shake the fronds in a paper bag so the spores are contained when released from the fronds (Hansen, 2003). Spore viability highly variable, usually low after 1 year. Store spores in glassine envelopes or in packets or waxed paper. Store packets in 1-4 degrees C, in moisture-tight and air tight containers. . Spore viability varies among fern species from just a few days to several years. Propagation recommendations (plant seeds, vegetative parts, cuttings, etc.) Sprinkle the spores onto a bed of moistened peat moss, cover with plastic and place in a shady, but not completely dark, location with a temperature between 59 and 86 degrees Fahrenheit. Do not let the container dry out, but do not let mold grow in it either. Wipe away condensation to help prevent this. After several weeks, flat heart-shaped discs, called gametophytes, will appear. Mist with water if they appear dry and be sure to keep them moist. A few weeks later, tiny fern fronds will sprout from the gametophyte, which will eventually wither and die as the fern establishes itself independently. The ferns can be transplanted to individual containers a few weeks after the fronds appear, but take care as they are very fragile (Hansen, 2003). Humus-rich, moist soil, with pH 6.1 to 6.5 (mildly acidic). No inoculum necessary. Commonly obtained through salvage. The best form of installation is from divided material. Plants grown from spores should be 1.5-2 years old before planting to ensure survival. Average Water Needs; Water regularly; do not overwater. Soil pH 6.1 to 6.5 (mildly acidic). 1. Holloway, Dr. Patricia S., “Tips on Collecting, Processing, and Storing Fern Spores” Georgeson Botanical Notes, No. 17. University of Alaska Fairbanks, April 1994. 4. Jones, David L., 1987. Encyclopedia of Ferns. Portland, Oregon. Timber Press. 5. Kruckeberg, A.R. Gardening with Native Plants of the Pacific Northwest (1982). 6. Pojar, J. and MacKinnon, A. Plants of the Pacific Northwest Coast. Lone Pine Publishing, Redmond, WA. 1994. 7. United States Department of Agriculture, July 3, 2000. Integrated Taxonomic Information System.[Online]. Available: http://www.itis.usda.gov/plantproj/itis/cgi_bin/class_report.cgi?kingdom=Plantae&input=504530&input_type=T[October 10, 2000].